A Division of Whittaker Corporation. 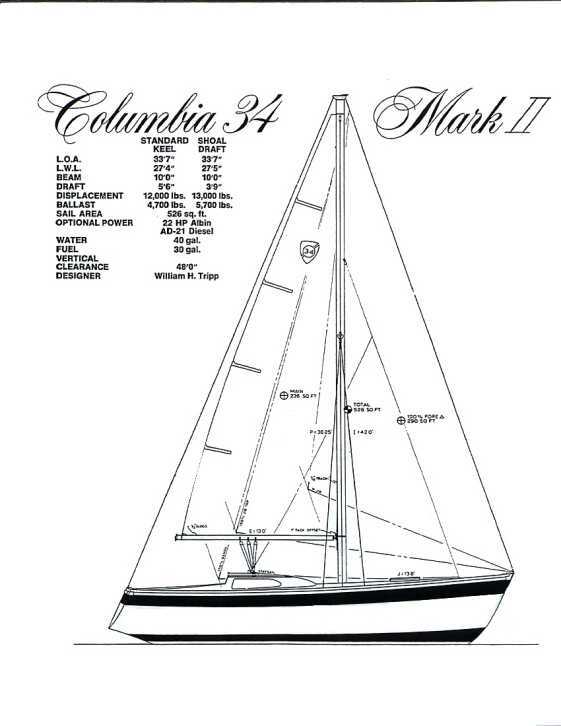 The Columbia 34 MkII was one of the Bill Tripp "Bubble Top" designs. According to John Broughton's notes, the C-34MkII was built from 1970 to 1975. 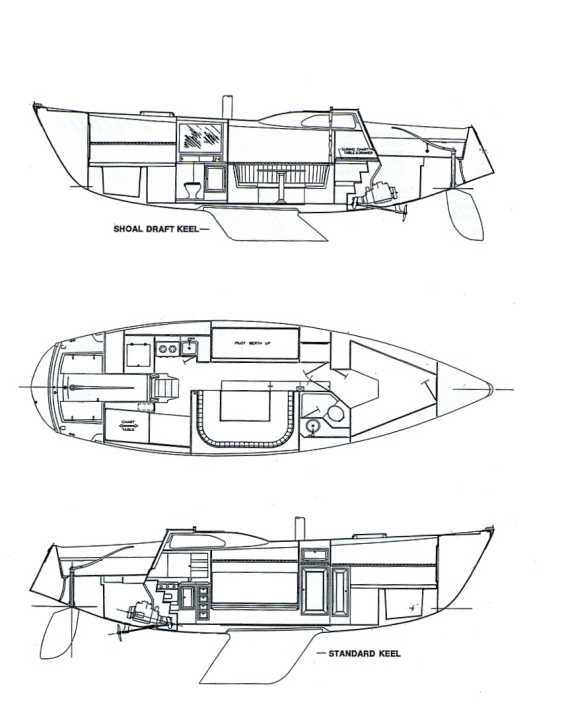 The following specifications and diagrams came from original C-34 MkII brochures. 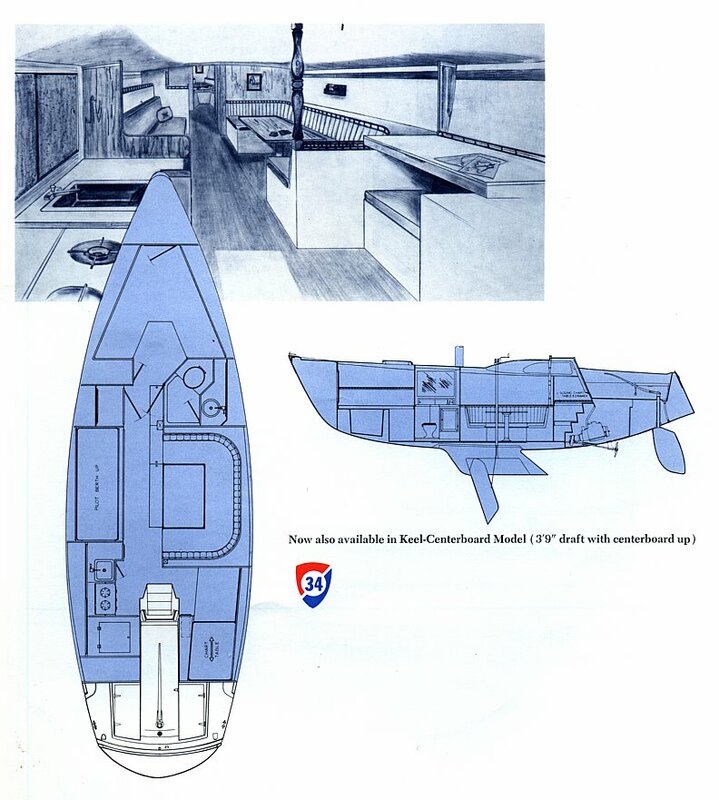 Here is a diagram from an early brochure showing the centerboard version. The centerboard version only shows up in the early advertising. It drops out and the shoal draft fixed keel version appears. Ballast (lead):    4,700 lbs. 5,700 lbs. 5,700 lbs. Sail Area:           526 sq. ft.
More brochure diagrams: C-34 MkII diagram and specifications. Shoal and deep keel outlines. Boom to Masthead: 38' 0"
Deck to Boom: 4' 0"
Deck to Masthead: 41' 0"
The time is August 1995. We had just bought our first big boat . The Eclipse was a 72 Columbia 34. It was Friday afternoon and we were finally headed out into open water for a long three day weekend at Catalina, the little island 26 miles from Los Angeles harbor (as the song goes). The wind was stiff and we were as close hauled on a starboard tack heading across the San Pedro channel. The wind was a good 15 Kts maybe 17kts. We had the 155% up and were healed over pretty good when Lisa looked down into the cabin and said , "Oh-my-god! We're sinking!". There was 10" of water sploshing around behind the stove, over the sink top and on the floor. It turns out the sink on the Columbia 34 actually is below the waterline when healed over 30 degrees on a starboard tack, and was letting water in at an alarming rate. It took us a few minutes get the boat up, to isolate the source of the water, close the sink drain thru hull valve, pump the bilges and then get back on track. Lesson #1 of the weekend was close the galley sink thru hull valve when healed over on a starboard tack! Dave's full C-34 MkII review. For all other props, the distance from stuffing box to centerline of prop is 15 times the prop diameter MINIMUM and the clearance at prop centerline to hull is 1/4 (0.25) of the prop diameter MAXIMUM. You can probably play with the pitch to match your actual horsepower V.S. the factory rated horsepower. Just keep in mind that thrust which exceeds your actual hull speed or theoretical hull speed (your choice) is only a waste of fuel and will cavitate your new prop.